From the minute the curtain drops, Vincent Furnier ceases to exist. 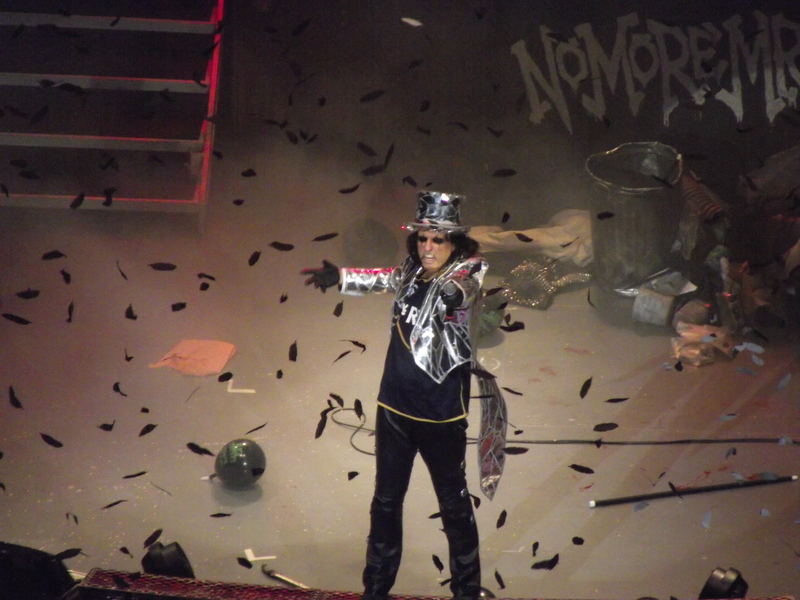 In his place, Alice Cooper stalks the Earth. Alice, a man in his 60s remember, is a constant source of energy, prowling, snarling, baiting the audience. From the minute the curtain drops, Vincent Furnier ceases to exist. 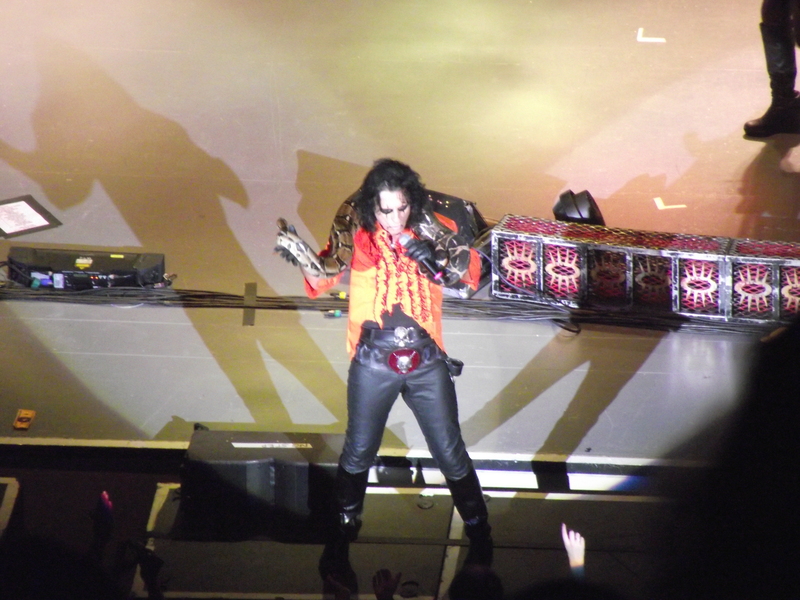 In his place, Alice Cooper stalks the Earth. Alice, a man in his 60s remember, is a constant source of energy, prowling, snarling, baiting the audience. Hardly ever without a cane, a whip, or a sword in his leather clad hands, he energises the band around him. They feed off his leads and theatrics, making this more than a rock show – it’s an event. The band gel beautifully and operate independently of Alice, sometimes treating his character’s antics with contempt, other times joining in with them. It all makes for a spell binding visual and aural assault. Alice throws himself with relish into his role as conductor of this mayhem, playing on the dynamics of each song and section of the show. And the music? It’s ridiculously good. The setlist spans his entire career from Halo Of Flies right up to new song I’ll Bite Your Face Off and everything in between. The favourites are there, of course – a gloriously riotous School’s Out (complete with Another Brick In The Wall interlude) and a joyous romp through Elected tailgate the show, but obscure 80s track Clones (We’re All) and 90s pomp metal Feed My Frankenstein threaten to steal the show. With a back catalogue as deep and diverse as Alice has, there’s always a few tracks he’ll miss out – Welcome To My Nightmare didn’t get an airing, and only one track from the new record – but almost everything you’d expect is there. It has to be said as well, I don’t think Alice has sounded as good in years. Vocally, he was spot on all night – and the sound mix was incredible – I honestly can’t remember a gig that had as clear and crisp a sound as this one. For 100 minutes, there’s no ill in the world, beyond Alice himself. Problems pale into insignificance as Alice lectures you on Cold Ethyl’s reputation in bed, or how the Reverend Smith punched him in the nose. It’s the perfect escapism from everyday problems, and it’s played as such. There’s no pretentions, no hidden agenda – it’s just a good old fashioned Rock n’ Roll show. Clones may come and go, but Alice is still the master.